Not sure how this will look on my blog…this is my first mobile posting. The vessel in the picture is the reason I have written a grand total of two pages in two weeks. 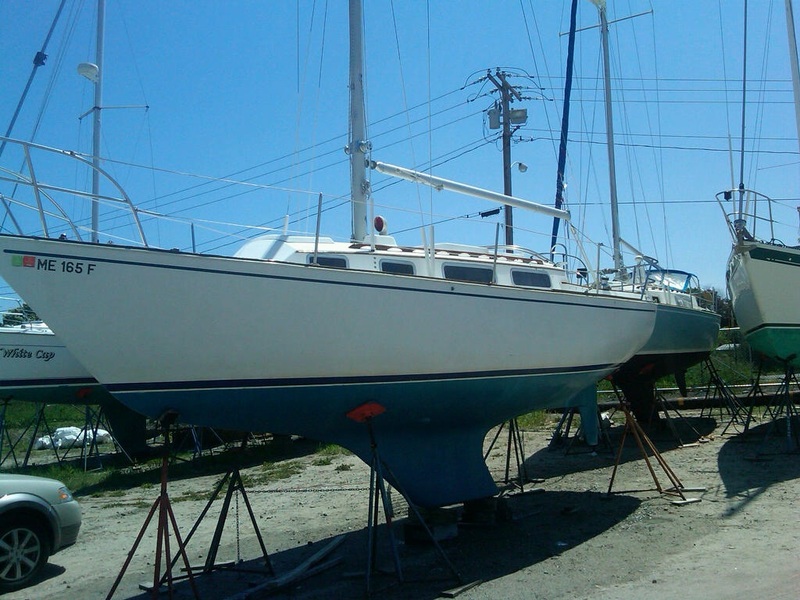 Painting, waxing, buffing, varnishing, washing…more waxing. Leaving town for Memorial Day weekend didn’t help either. Vessel Name: Dolci (Italian for candy or sweet). She certainly is a sweet boat, and well worth the distraction. Thanks to April showers, she’s almost three weeks late reaching the water. Today is the big day. One more excuse for a low word count…but can you really blame me? I’m on my way. I can edit books on the boat…. Our club has a WiFi signal you can grab. I must admit that I haven’t done any writing out on the boat…a little warm inside the cabin when not underway, and too bright out on deck for my computer. I’m probably not dissuading you. She’s a beauty! What is she, about 34 feet? Here I am stuck in the middle of the damn desert. Haven’t seen the sea since leaving California in 2003… making me homesick now. She’s a Sabre 28…34 feet would be a little big for us on day sails, however, after about a week or so cruising up the coast, I’d use up one of my three wishes to expand the boat by 6 feet. The desert is the one place we really miss out here. We lived in San Diego for several years, and loved taking a late spring day trip from the coast, thru the snow of the Cleveland National Forest, then into the Anza-Borrego desert. We never saw the spring flower bloom out there, which we regret.